WICHITA FALLS, TX — Former Dallas Cowboys and San Francisco 49ers great, Charles Haley, was the guest speaker on Sunday, Aug. 23 at the Ninth Annual Midwestern State Athletics Welcome Back Dinner held at L. Ligon Coliseum. The event began with a silent auction and social at 5:30 p.m. with Dallas Cowboy and Midwestern State memorabilia as well as other valuable items. The dinner began at 6 p.m. and the program followed at approximately 6:45. Haley, who played for a lot of great coaches, talked about them and many of his famous teammates on Sunday night. Haley answered questions from moderator Jerry Johnson as well as from the audience. Source: News Channel 6. Haley played six season for the 49ers and won a pair of Super Bowl rings. But George Seifert, who succeeded Walsh as the 49ers head coach, sent him packing, delivering a final key piece to the championship teams of the 1990s for the Cowboys. “It hurt,” Haley said of being traded to the Cowboys in 1992. “I was just mad at the world. “Jerry Jones took a chance on me. The 49ers did a character assassination on me after I left. Jerry Jones loves the Dallas Cowboys and will do anything to make them better.” Source: Times Record News. Haley was enshrined into the NFL Hall of Fame on August 8 in Canton, Ohio. He is the only player in pro football history to win five Super Bowls including three with the Dallas Cowboys and two with the San Francisco 49ers. He played in six NFC championship games over a seven-season period. He started at left outside linebacker for the 49ers in the 1988, 1989, and 1990 games and at right defensive end for the Cowboys in the conference championships in 1992, 1993, and 1994. He was inactive for the Cowboys’ victory in the 1995 NFC Championship Game. When he walked away for the final time, Haley had amassed 100.5 sacks during his 169-game career. He was twice named NFC Defensive Player of the Year (1990 and 1994), voted to five Pro Bowls and named All-Pro two times. Sports Speakers 360 is a booking agent for pro athletes. 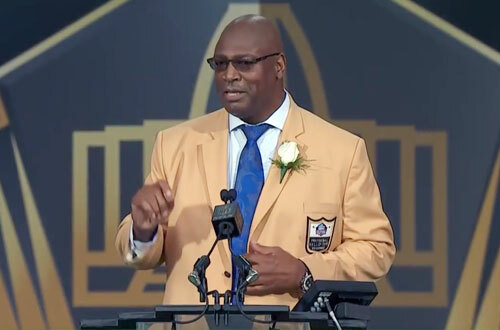 If you would like to book Charles Haley for a speaking engagement, appearance or endorsement, contact Charles Haley’s booking agent for fees at 1.855.303.5450.